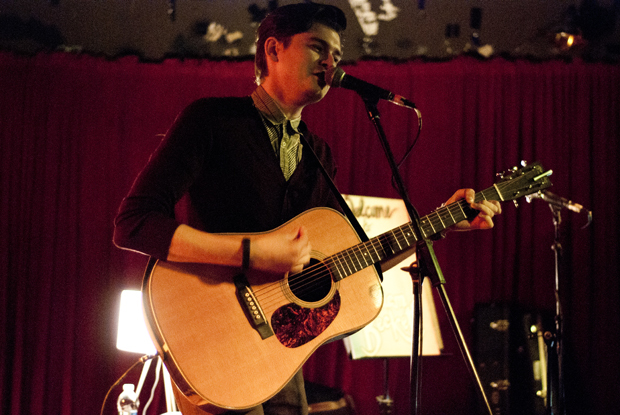 Under The Gun sent photographer Tori Thomas to the Walk The Talk Tour featuring William Beckett (formally frontman of The Academy Is…) and Cara Salimando. The show took place at The Grog Shop in Cleveland Heights, OH on May 10th. I arrived to this early show not knowing what the night would have in store for me. My friend and I arrived to the area rather early to hang out in town before the show, and not many people where waiting outside. When we actually went to wait in line, there must have been a total of 10 people in front of us, it was quite sad. We thought more TAI fans would have come to the show and supported William. Throughout the night, more fans showed up to show support. By the time William went on stage there was 75-90 people in the crowd, and I guess that is a very good turn out for this tour. William Beckett was starting back up on his feet after The Academy Is… breaking up in 2011, and he is building himself back in the industry. I didn’t know what to expect from the opener, Cara Salimando because I’ve never heard of her or listened to her music, but she blew me away. She gives off the look of a teenage girl, but she leaves you charmed with her wit, sarcasm, and jokes (and if you like cats, her comments about cats). Her majestic voice really won me over and I had to purchase her EP, which I have been listening to non-stop. Check her out if you like good music, catchy piano tunes, and awesome lyrics. Then it came time for William Beckett to hit the stage. I kind of knew what to expect, but not fully. I’ve seen The Academy Is… multiple times and I expected him to bring a little bit of that to the show; the only thing different about the set was him having to play the instrumentation, in TAI, Bill could run around on stage entertaining the audience with his moves. He did incredibly well; I would have to say he sounds much better live than on a recording. I love the rawness at the live show. At the end of his set, he mentioned that he would be returning in the fall with a full band behind him. Check out my photos from the show after the link!